The experienced HVAC technicians at Pro-Tech Heating & Cooling know firsthand that a buildup of sediments from the water passing through your water heater can create several problems. Too much sediment restricts the space inside the water heater, causing water shortages and a ‘rotten egg’ smell. If left unchecked, the sediment buildup can eventually damage your water heater beyond repair. Pro-tech’s professional technicians know how to prevent water heater system failures. We offer a wide variety installation, maintenance and repair services guaranteed to satisfy your needs. We work with only the best products available from dependable manufacturers, such as Bradford White. 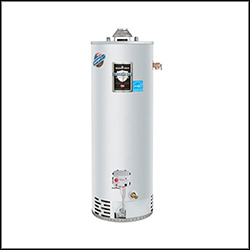 Regular checkups and services from the experienced professionals at Pro-Tech will keep your water heater running smoothly and efficiently for years to come. When it comes to ensuring a worry-free experience with water heaters, call Pro-Tech for the best solutions in Grand Rapids. For more information on the water heater services at Pro-Tech Heating & Cooling, please contact us here or call us directly at 616.534.5000.